New Jersey Devils tickets are easy and safe to buy online. Ticket prices start at $15, and seeing a hockey match is a great experience. The New Jersey Devils play at Prudential Center, a big indoor arena in Newark, New Jersey. The hockey season runs from October to April. Attending a hockey game is always fun, it doesn’t matter if you are a hockey fan or not. If you’re visiting New York and can’t get tickets to Rangers or Islanders and you don’t mind travelling a bit further, then a Devils game might be for you. 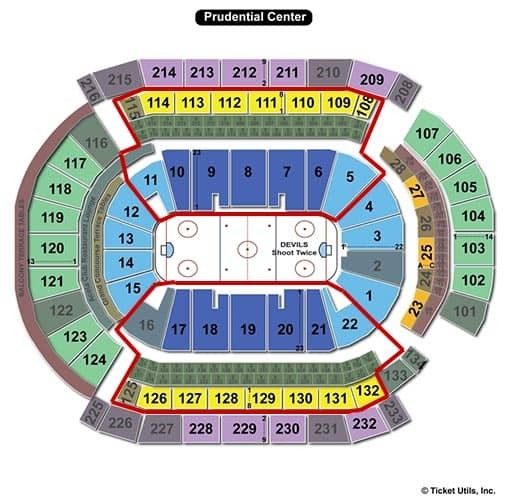 Buy New Jersey Devils tickets by viewing the schedule here or see the list below. Tickets can be paid by credit card. Paper tickets will be sent by post and e-tickets are sent to you by email. You can also pick up your tickets in New York from a local pick-up point. This option is FREE. If you are not able print out your purchased tickets, you can print them at the local pick-up point too. The pick-up point is centrally located, near Times Square. E-tickets are always delivered fastest and local pick-up is the best option for all other types of tickets. I highly recommend these options if you’d like to save on shipping costs. Your tickets are 100% guaranteed authentic and always delivered on time. The tickets sold on the site are from New Jersey Devils season ticket holders who are unable to attend the game themselves. Therefore the tickets are sometimes offered at discounted prices. Sometimes the tickets are more expensive than the original price which means that the New Jersey Devils game is already sold out. What are Good Seats at a New Jersey Devils game? Good seats are always important when going to a hockey game, if you want to catch a glimpse of the puck. But you are also going to enjoy the atmosphere. You’ll find best seats in sections, 7, 8, 9, 18, 19 and 20 but these are also the most expensive tickets costing around $100-$280 per ticket. The closer you sit to the rink, the better the view but you can buy cheap tickets with a decent view from higher up as well. Section 100 offers great seats for $60-$150 per ticket. The cheapest seats are in section 200 but I recommend to avoid them as they are too far from the rink even though they only cost $45-$55. Ice hockey season runs from beginning October through mid April. All home games of New Jersey Devils are popular so plan well ahead. The New York Rangers and New York Islanders also play in these months. How to get to Prudential Center? It’s easy to get to Prudential Center in New Jersey by train as the arena is just two blocks from Newark Penn Station. Trains run often and are easy to use. Take Northeast Corridor or North Jersey Coast Line from Penn Station New York to Newark Penn Station, the ride will take around 20 minutes. It is a short walk to Prudential Center. Just follow the jersey wearing crowd! If you are staying near Financial District you could also travel with PATH-train from the WTC-station. Travel time is about 24 minutes. When Should I Arrive at Prudential Center? It’s a good idea to arrive 30-60 minutes before the game starts so you have enough time to find your seats and grab a drink. The easiest way get back to Manhattan is to go the same way you came. I like to use the PATH-train, because it’s fast and cheap. There will be a lot of people traveling back to Manhattan so it will be safe. Both trains run through the night.